This week, I share a website I recently discovered while visiting with a colleague from the University of Toronto. The Balanced Literacy Diet website takes an innovative approach to supporting teachers, parents, administrators, and teacher-educators in preventing literacy failure. 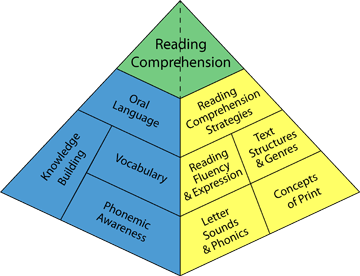 The Balanced Literacy Diet approach uses a familiar metaphor to address the complex nature of teaching literacy: the food pyramid. On this site, the food pyramid is transformed into a reading pyramid and a writing pyramid. Fifteen essential “food” groups form the foundation of the literacy diet. The food groups include topics such as motivation to read, writing processes, and text structures, for example. View a full list by clicking here. Teachers can then use the recipe finder to locate activities and explanations built on the food groups. For example, one recipe for fourth grade addresses the food group, “Real Writing: Text Structures” through a math lesson (see figure 2, below). The recipe includes an activity objective, four images of student work products, a video with a teacher explaining the recipe, and a transcript of the video. Links to other recipes by the featured teacher are included. Each video is concise and just long enough to keep the viewer engaged. The math literacy lesson video is just one minute, twenty-three seconds in length. Another innovative feature of the site is the virtual classroom tour option. The virtual classroom tours are interactive; that is, the viewer controls what to look at in the classroom and can point to features which then pop-up a description and additional video describing what is on the screen. I recommend using Chrome or Firefox rather than Internet Explorer at this time; Internet Explorer 10 appears to limit what you can do on the website. The Literacy Diet website is a project of the Melissa Institute for Violence Prevention and Treatment. A key tool in the Institute’s arsenal rests on the idea that improved literacy for students translates to a more peaceful and less violent society overall. Please take a moment to read about the Institute. The Ontario Institute for Studies in Education at the University of Toronto hosts the site. 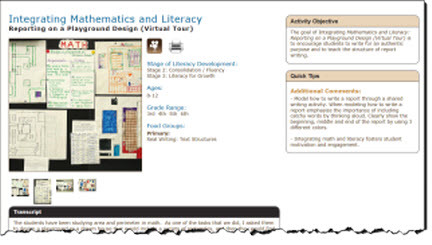 You may want to grab a soda and snack before you visit the Literacy Diet site—once you start reading, viewing, and touring the recipes for literacy success, you may spend more time than you planned getting to know the innovative teachers on this interactive and useful site. Teacher educators will find all kinds of useful examples for the teachers-to-be-with whom they work. Excellent ideas gathered by grade/age, stage of literacy development, and food group will inspire new ideas for teachers, parents, and administrators.